Today started off a little slow but I made good progress in the evening. I decided to really embrace the 24 tropes and make a parody/homage game out of this. This has the added benefit that I don’t have to spend time fleshing out characters since eight seasons of 24 already did that for me! Now I can get right to the meat of writing the story. Building on the scraps of story I penned yesterday I wrote the full scenario for the game today. I’m trying to avoid what I did with Coyote where I wrote too much story and not enough good puzzles. The first half of the scenario started to feel a bit like that after I wrote it, but I managed to fill it up with more interactivity later. So now the game needed a working title. My first hunch was to name it ’12’, possibly referring to the number of minutes you’d need to complete it. That might be a bit too short thought, so I upped it to 15 minutes. To start things off I decided to recreate the 24 title sequence for the start of the game. I tracked down the fonts and downloaded some 24 soundtracks, then fired up After Effects. I’m pretty pleased with the result of some simple masking and a few keyframes. I could have made it resemble the source material even closer, but that was not the point of the exercise. Now it was time to tackle the biggest feature of the game – the realtime clock. Thankfully Monkey_05_06’s Countdown module could do most of the work for me (I like it when that happens). I slapped it on a GUI and man, it works like a charm. I already experimented with triggering some events at a certain point during the countdown, and so far it seems to work just dandy. The only problem I had was with sound files being triggered more than once (since I check the timecodes in the rep_ex). 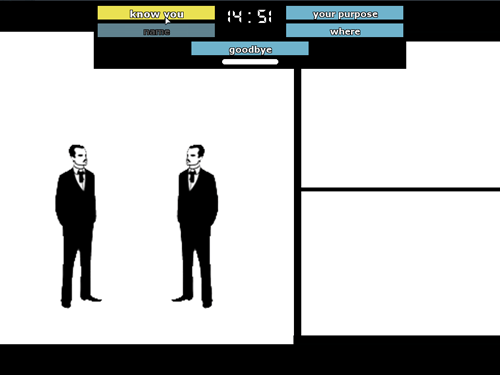 I then imported my custom dialog engine and repurposed a few bits to suit this game. Seeing that ingame got me really excited! My next challenge will be to tackle the splitscreen – another staple of the 24 show. I have a few ideas on how to do it, we’ll see tomorrow which one will work best.